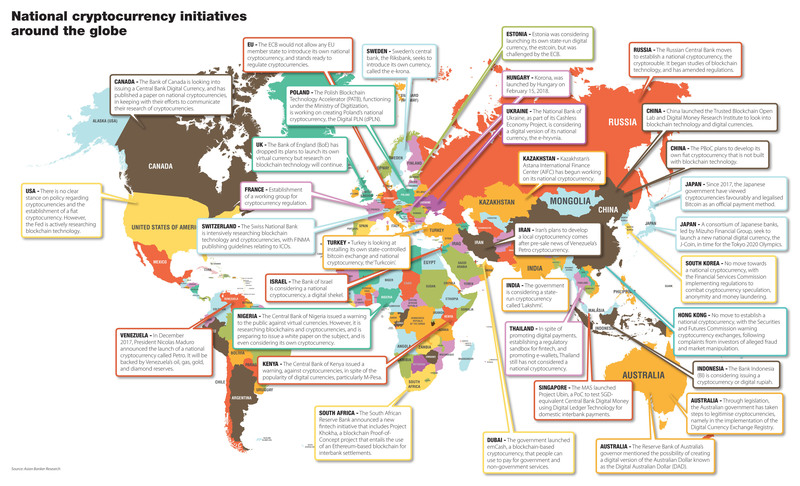 Despite concerns over the unbridled speculation that has inflated the value of cryptocurrencies and initial coin offerings, many governments have embarked on cryptocurrency initiatives that may render them legal tender in the not too distant future. 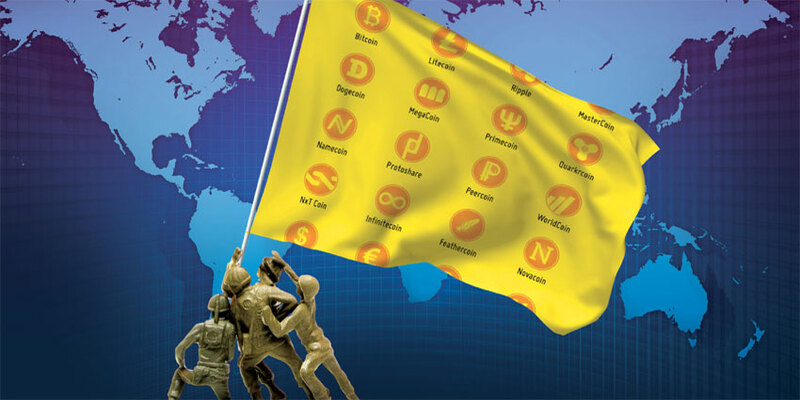 The rise of the cryptocurrencies is a major concern among governments across the globe as it threatens to uproot the traditional banking and financial system. It allows payment transactions to occur efficiently and anonymously between parties without the intervention of intermediaries such as banks and clearing houses which essentially makes it easier for money laundering and other illicit activities to be transacted. However, it also brings benefits of speed, efficiency and security. With that, several countries are developing and launching their own virtual fiat currencies so as to offer users a hybrid system - combining the benefits of both traditional and cryptocurrencies. Establishing a national cryptocurrency can combat one of the major drawbacks of existing cryptocurrencies - volatility. However, to the purists a fiat cryptocurrency would be a oxymoron. The argument is that cryptocurrency is meant to be decentralised, anonymous and controlled by no single entity. However, fiat by its very notion has to be backed by an authority that engenders the trust of transacting parties. Suffice to say that a fiat cryptocurrency that governments are contemplating is one that would be a trusted currency based on cryptography and distributed ledger technology (DLT) that would also mitigate against the price volatility of an “unbacked” alternative such as bitcoin. A national cryptocurrency is usually backed by the nation’s official currency which makes them less volatile and easier to determine their worth. In addition, introducing a national cryptocurrency can also substantially accelerate the speed of payment as it bypasses the clearing process (a trait of the existing electronic payment system) and transactions can be recorded instantly. How do cryptocurrencies revolutionise payment and financial transactions? Blockchain technology - the core technology behind cryptocurrency, is undoubtedly a major disruptor of the global business process that have the potential to revolutionise the current economic structure and alter how financial institutions operate. Since Satoshi Nakamoto introduced bitcoin, the most popular form of cryptocurrency, to the world in 2009, a lot has happened in the cryptocurrency space. Bitcoin enables digital transactions between two parties without the need of a third party. When someone makes a transaction, computers or ‘nodes’ process the transaction and digitally record them in blocks which act like ledgers. Once the transaction is verified, it is given a unique address and connected to existing blocks using hashtags. As such, a linear chronological sequence of such blocks forms a blockchain. It is noteworthy to mention that even though these transactions are recorded, the information of the parties engaging in the exchange is not revealed. This new way of managing transactions can indeed usher in a huge revolution. 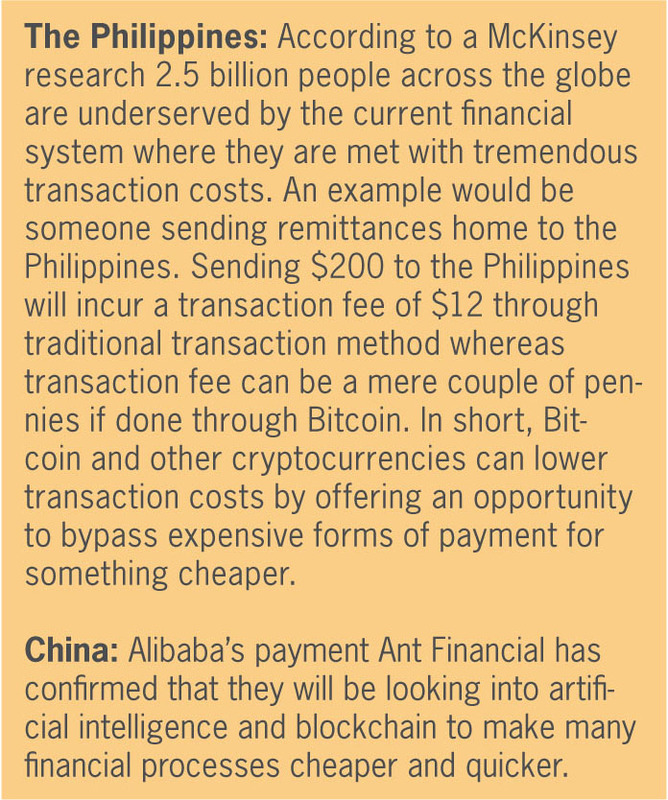 In the mainstream financial environment, cross-borders transactions require a clearing house, financial intermediaries and the Society for Worldwide Interbank Financial Telecommunication (SWIFT). SWIFT is an entity that offers a network for financial institutions across the global to exchange information with one another. However, cross-border transactions are currently subject to high transaction fees, long processing periods, and a lack of transparency. The emergence of cryptocurrencies which introduces a new transfer protocol, alters this environment. The role of the middleman is no longer required for authorizing transactions. Cryptocurrencies offer low transaction fees which can be as low as a couple of cents and allow for anonymity and privacy. Furthermore, transaction time is a matter of seconds and minutes. However, a caveat of all this is the higher likelihood of illegal activities going unnoticed. The current centralised payment processing procedure prevents money laundering, terrorist activities, and illicit trade in drugs and ammunition. Cryptocurrencies offer a decentralised system which means that it is much more difficult for central banks to trace transactions and identify parties of an exchange. The dominance of the United States is evident from the reliance of the global economy on the US dollar which is the reserve currency. This is the very reason why the contagion effect from the US financial market is so widespread during the financial crisis. The United States Treasury is essentially a de facto global central bank. This form of centralisation is undermined by cryptocurrency operations. Cryptocurrency enables decentralised transactions to occur without the utilisation of the US dollar. This changes the dynamics of international trade, foreign relations and the impact of economic sanctions. Cryptocurrency provides an escape route for nations facing stiff international economic sanctions. 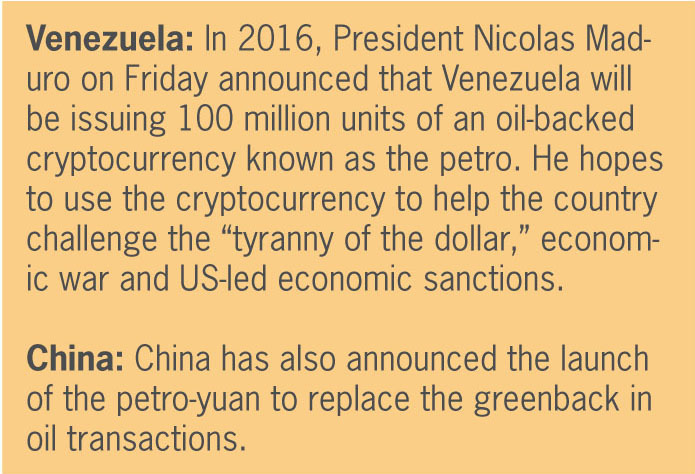 The fact that they are anonymous and decentralised limits the effect of US economic sanction on trade deals for countries like Venezuela, Russia and China. 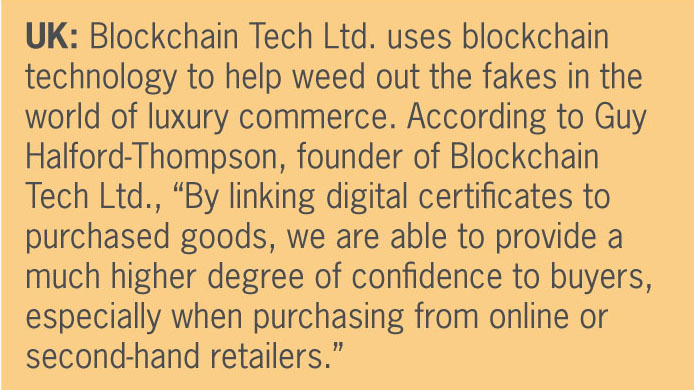 Blockchain can be used to confirm the authenticity of products by allowing customers to look back through the records for a specific item. Due to blockchain being a distributed ledger, counterfeiting is very difficult. This is exactly what makes this technology extremely attractive as a currency. Blockchain allows consumers to track every touchpoint in the lifespan of a product as it moves through the supply chain, from a supplier to a manufacturer to a shipper. This makes it easier for consumers to verify the authenticity of a product and to ensure the confidence in resale markets. Governments are looking into utilising distributed ledger technology (DLT) to increase the efficiency of multiple operational segments across numerous industries, through initiatives aimed at creating a more unified effort, particularly in ramping up adoption in the financial services industry. The initiatives also serve to further clarify the role of digital currencies and DLT in the “existing regulatory context and the market infrastructure” said Anthony Lewis, director of research at R3 Singapore. “Blockchain or distributed ledger technology, that underpins cryptocurrencies, enables asset transactions,” said Oliver Bussmann, president of Zug-based CryptoValley Association. As such, there has been an increase in cooperation and research in DLT, particularly on the national and international levels. This blossoming interest in the field is evidenced by the Monetary Authority of Singapore (MAS) and eight banks, in conjunction with R3, launching a pilot proof of concept (POC) project that looks at blockchain technology for inter-bank payments, including cross-border transactions in foreign currency. The MAS also plans to issue a digital currency that participating banks my use for the settlement of transactions. Also, the Hong Kong Monetary Authority (HKMA) established a fintech innovation hub to test blockchain. In Switzerland, the financial services industry recognises the need for a national cryptocurrency. “Regulated financial service providers need a cryptocurrency and digital assets platform in the future,” said Peter Hofmann, an associate at Swisscom AG. which provides technology and core banking outsourcing services to banks. In this regard, the industry has been testing a Swiss franc cryptocurrency. “We have developed a clearing and settlement system for equities with a Swiss franc token and direct interface to the payments system, a POC of the technical feasibility,’ said Thomas Ankenbrand of the University of Lausanne which is actively involved in the research and application of DLT. On the global level, the forefront of international standards in blockchain was established with the approval by the International Organisation for Standardisation (ISO) of Standards Australia’s call for new international benchmarks for blockchain. Despite banning bitcoin trading and initial coin offerings (ICOs), the People’s Bank of China (PBOC) actually has plans to develop its own fiat cryptocurrency. This is spearheaded by the Digital Money Research Institute, headed by Yao Qian, a former researcher at the Bank of China. Yao raised the concept of a hybrid system whereby digital-currency wallets and traditional bank accounts could exist side-by-side with a national cryptocurrency and the Renminbi. China has one of the most advanced mobile and digital payment markets in the world, where the use of mobile-enabled QR code payments at big, small and even micro merchant outlets has become ubiquitous. The authorities are strongly committed to developing its own digital currency under the PBOC. Besides, speed, efficiency and cost, a cryptocurrency-based payments framework would allow the central bank greater oversight and control over the financial system. In this case, a digital fiat cryptocurrency, one which is backed by the central bank and has the same legal status as a bank note, can lower financial transaction costs hence making financial services more affordable and accessible. This is especially important in China where millions still lack access to bank services. Furthermore, a virtual fiat currency can help the government exercise greater surveillance over digital transactions which can help reduce corruption - a key priority for the government. Another country which has been successful in leading the cashless charge is Sweden. Its central bank, the Riksbank, is seeking to introduce its own virtual currency, called the e-krona. The currency would be based on a DLT-styled register-based system. Sweden is well-positioned to be the leader in this field because it is already digital friendly and more comfortable with non-physical financial transactions than other countries. This is evident in the decreasing amount of notes and coins in circulation which had fallen by 40% since 2009. With Sweden’s rapid move towards a cashless society, the government is seriously considering a digital complement to cash that can ensure a safer and more efficient payment system. India became the first country in the world in November 2016 to take the bold step of “demonetising” its official currency notes, notes of 500 and 2000 rupees were completely removed from circulation, in order to stem underground illicit activities hitherto concealed by the use of the rupee. Despite the widespread hardship it caused to residents and businesses, it did succeed in shifting a vast proportion of Indian to cashless payments. It has also started to conduct research on DLT technology to create a digital alternative to the Indian rupee. The government is considering to a proposal to introduce a state-run or fiat cryptocurrency which is similar to bitcoin called ‘Lakshmi’. Most countries are not as digital or as ready to embrace cashless transactions as much as China, Sweden or even India. In fact, Japan is still very cash-based, which is not unexpected as it has the most rapidly ageing population and in recent decades has slid down the productivity and growth ladder. To re-establish itself as the technology and innovation powerhouse that it once was, the country has chosen to focus on developing itself into one of the world’s leading cryptocurrency and DLT hubs. The Japanese government has viewed cryptocurrencies favourably, legalising bitcoin as an official payment method earlier in 2017. There are 16 Japanese cryptocurrency exchanges that are registered with the Financial Services Agency to create a self-regulating body, particularly to safeguard investors, following a theft by hackers amounting to $530million from Coincheck Inc. The establishment of a national cryptocurrency has the potential to lessen transaction times, reduce associated costs and provide assistance to those who have inadequate access to traditional banking services. The Financial Services Industry implemented a law that took effect, making cryptocurrencies legal currencies that are acceptable as a means of payment. A consortium of Japanese banks, led by Mizuho Financial Group and Japan Post Bank, is seeking to launch a new national digital currency, the J-Coin, in time for the Tokyo 2020 Olympics. The J-Coin has the support of Japan’s central bank, regulators, and aims to develop technology to allow the Japanese people to pay for goods and services with their smartphone. The J-Coin will be exchanged at a one-to-one rate with the yen. Similarly, the city of Zug in Switzerland, and Dubai, the financial capital of the United Arab Emirates (UAE), are leveraging the potential of the cryptocurrency to also reinvent themselves as “Crypto” hubs. Switzerland made the move to become a “crypto-nation” when it launched the ‘Crypto Valley’ in Zug in late 2016. While this was essentially a private sector initiative, the Swiss Financial Market Supervisory Authority (Finma) soon followed up to introduce a regulatory framework to enable DLT start-ups and ICOs and aid entrepreneurs in navigating the supervisory landscape. In addition, a regulatory sandbox was established for start-ups to experiment with new technologies. while working with the State Secretariat for International Financial Matters. Recognising the trend of increasing digitisation of financial assets and transactions and the need to establish a system for such digital assets to be enabled and transacted, Switzerland’s stock exchange chairman Romeo Lacher proposed the ‘e-franc’ as a crypto version of the Swiss franc. Separately, the Swiss National Bank (SNB) has been studying the issues of cryptocurrencies and considering possible effects on the financial ecosystem. It has not responded to the stock exchange chairman’s proposal of an e-franc, but is intensively researching DLT technology and cryptocurrencies, choosing to view cryptocurrencies as more of an asset than a currency. Moving slightly faster than the Swiss, the authorities in Dubai had actually launched emCash, a DLT-based cryptocurrency in October 2017 that people can use to pay for government and non-government services. This is in line with country’s ambition to be the world’s first DLT-powered government, particularly by going paperless, with regard to all visa applications, bill payments and license renewals being transacted digitally. There are countries that are looking to introduce cryptocurrencies so that they can circumvent the traditional banking and financial system altogether. These are pursued with great efforts and for more nefarious reasons, such as to escape sanctions that have been imposed on them. Into this category fall heavily sanctioned countries such as Iran, Russia and Venezuela. The ministry of finance drafted the Digital Assets Regulation Bill, defining cryptocurrencies as digital financial assets, and are not legal tender. It also defined bitcoin mining as an entrepreneurial activity which led to a disagreement between the ministry of finance and central bank on the trading of cryptocurrencies. Additionally, the central bank has also proposed the creation of the first joint multinational cryptocurrency to be adopted by the BRICS (Brazil, Russia, India, China and South Africa) and the Eurasian European Union (EEU). Other heavily sanctioned nations, notably Iran and North Korea, could follow suit. In spite of the increased efficiency and opportunities for innovation that a cryptocurrency and its underlying DLT technology brings, some countries are wary about it replacing their fiat currencies in the form of traditional bank notes and coins. The Monetary Authority of Singapore has expressed a desire to avoid issuing digital currencies to the public due to its susceptibility to fraud and security breaches. But this has not stopped it from conducting its own experiment with DLT technology and its own digital currency before deciding whether to commercialise the trial. In the United Kingdom, the Bank of England (BoE) established a research unit to look at the introduction of a cryptocurrency linked to the sterling pound. The central bank-issued cryptocurrency would allow British users to keep their digital money with the central bank itself, thus eliminating the need for retail banks. This would allow for large transactions to be carried out almost instantaneously. It followed the successful tefst on DLT conducted by the BoE, also raising the possibility of applying DLT technology for settlements between central banks, hence adding to financial stability and efficiency. However, plans were dropped due to concerns about the possible disruptive impact on the financial system. It was concerned that the public may stop using commercial bank accounts and move directly to BoE’s digital payment system for transactions, which may de-stabilise the financial system. 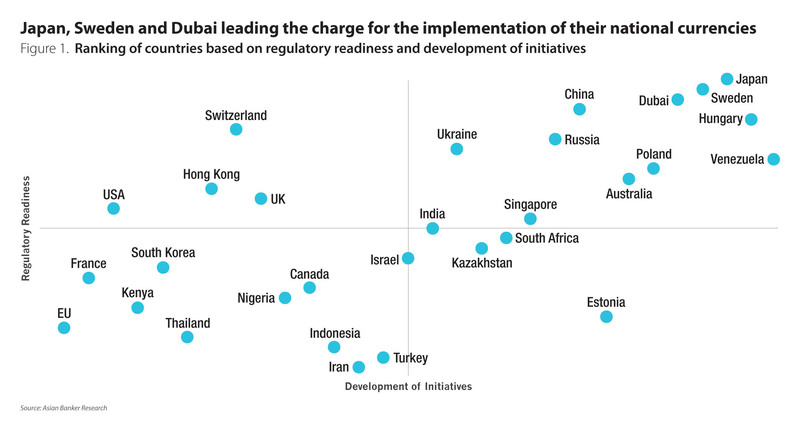 However, with developments increasing in speed and scale, institutions saw the need for regulators to manage risks and provide strong governance. This need was underscored in June 2016 by the hacking of a smart contract on Ethereum’s public blockchain to access funds amounting to nearly $50 million. It was also further underscored by the HKMA’s warnings of blockchain encouraging money laundering. Hence, consortiums are working with regulators by providing explanations on risks and benefits, sharing information with regulators to facilitate compliance and regulatory reporting. Therefore, governments have begun planning and implementing initiatives relating to cryptocurrency, particularly to mitigate challenges that hinder the adoption of cryptocurrencies and DLT. Firstly, there is the challenge of data security and privacy. The public sharing of sensitive contractual information with the keeping of sensitive information in the shared ledger. Another challenge is the uncertainty of regulations, which can be reduced through cooperation and consultation with industry stakeholders. Yet another challenge is the issue of nascent technology, which can be alleviated through a rigorous testing process. The challenge of scalability presents many issues to be dealt with. To attain an adequate scale, there is a need for consensus by the industry, taking into account varied business requirements. As such, in the financial services industry, cooperation is needed from banks, technology companies and regulators. Another major concern is the need, particularly with respect to international payments, for the technology to be available and accessible to all parties in the ecosystem, regardless of size. The issue of existing technology and systems reduces the network effect, which would be difficult to achieve as it requires coordination between all the stakeholders. This may be circumvented by providing allowances for stakeholders that continue to use existing settlement infrastructures.